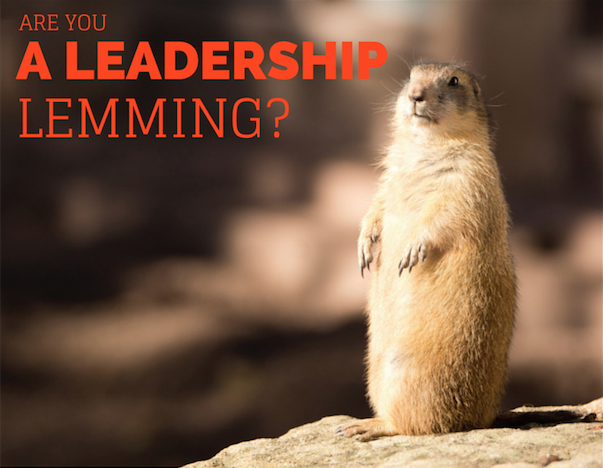 Are You A Leadership Lemming? A lemming is in the rodent family of animals. Lemmings are known for following each other—no matter what…even right off the proverbial cliff to their deaths. According to Wiki, this might be stretching the truth a bit. Due to a “strong biological urge,” a lemming will recognize an overly populated condition and will head off into the wild to find food and shelter¹. Unfortunately, many lemmings get this urge simultaneously, and when faced with a river to cross, for example, the rodents will risk their lives and forge the river–one following another while trying to make it safely across the river. Some make it; some don’t. These urges are in all of us–not just lemmings, in my opinion. We see a need for something to change and we charge out into the wilderness. We underestimate what is takes to cross rivers. Yet, this notion of one following another seems to hold true in many of our lives–despite the inherent risks involved. It might be “a strong biological urge” that presses us to leave an area based on survival assessments. Under those circumstances, we are willing to follow anyone going anywhere. We truly are in survival mode; we are not thinking as deeply as possible. We hope that the person in front is leading us to food, shelter, and safety. We are vulnerable. Interestingly enough, many doctors are in leadership positions–automatically granted to us because we graduated from an accredited college. We learned a lot of information about our respective areas; dentists get an abundance of information about the head and neck anatomy and functions. Yet, we really have limited training in how to lead others. As a matter of fact, many of us start out in survival mode–not high level leadership mode. Then, others are surprised when we fall short in our duties as leaders or clinicians. We are blamed for micro-managing, being poor business people, and failing to uphold professional responsibilities. I have to admit it took me awhile to figure out how to lead more responsibly, and it’s a continual effort. I was more of a boss, not a leader. Being visionary has its limitations. I can often see an end result quickly…and I grow impatient filling in all of the steps for others along the way. Knowing that about myself is one way I know my leadership abilities keep progressing; I am at least cognizant of my weaknesses. In my earlier days, I would simply bang my head against the wall when others would fail to follow my lead. I knew my way would get to the result faster and likely save time and money. Yet, I failed to recognize and appreciate the group skill set at the table. Somehow I would brush aside the hang-ups in my plans; I would forget that we had to go back and re-think some things. I would undervalue the needs’ of others to methodically walk through each and every step in an overall plan. In no way, am I perfect, but I am more balanced in my approach to leadership. I am out of survival mode, have surpassed striving mode, and work to continually find a greater good for the groups I work with and work for. Once in this better level of leadership, it becomes easier to assess how others are leading. It becomes easier to determine what is real and what is made up. It becomes easier to decipher who is leading out of self interest and who is leading for the greater good. I am familiar with the W.I.F.M. acronym (what’s in it for me), and surely I am not naive to believe we do not ever act out of self interest. I certainly do at times. Most of the time, however, or at least 50% of the time, I am acting with a greater consciousness of how I am impacting our world and those around me. To me, when we get to this stage or level of leadership, we offer patients a better healthcare experience. I am constantly on the look out for favorable experiences in my journey in life as well. If I were to report the experience I hate the most, I would say, “I hate the car salesperson.” In several car-buying experiences, I have left feeling cheated and annoyed. I detest the “let me go ask my manager” game, and the endless bantering over the final package deal. So, creating positive experiences for people, our patrons, is paramount as we serve others. When we get stuck in lower level leadership stages, like where the lemmings start out and never leave, we struggle to recognize the needs of others because the focus remains on our needs; we are still worried about our food, shelter, and safety. In our businesses, we struggle with debt and truly do worry about our food and shelter. With this instability, we willingly follow others–often with little due diligence completed on the person(s) we are following. When influencers pressure doctors–supposed leaders whom often aren’t yet, but want to seem like they are–doctors can become victims. We become the leadership lemmings in a heavily pressured culture. We go along with the influencers to avoid appearing unknowing; we remain silent to not draw attention to ourselves; we follow with our heads down. I created IntentionalDental Consulting to help others get out of the lemming leadership level. Playing it safe and remaining silent is stifling. It’s often suppressing to our inner beliefs. Moreover, it’s dangerous to follow the wrong influencers. A few close calls to the edge of a cliff and we realize how important it is to follow the right people. Sometimes we do get close to the edge. Mistakes happen. We learn things about others, and we choose differently the next time. I wanted to leave you with something light and airy. My daughter showed me this YouTube video about people following one another. I insist that you watch this hilarious YouTube video entitled, “Seeing Eye People.” https://www.youtube.com/watch?v=kNyTqIsrk0w. Improv Everywhere took to the streets of New York City and introduced a new service: seeing eye people—for those who want to text and walk at the same time, but are concerned about their safety. We cannot follow everyone every time. We must know what is right for us. And, we do need honest people around us to be our guides. If you are a dentist or know of one pondering change, wondering future steps in life’s journey, or simply not happy, call me for a consultation. I will lead. With honestly. Not off a cliff.